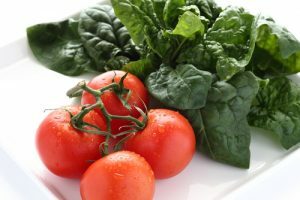 Home > California Health Insurance News > Health Tips > Tomatoes and Spinach: Is Cooked Healthier? Is cooked healthier? One of the biggest factors impacting your overall health is your diet, so it’s important to eat well. Certain foods, such as fruits and vegetables, provide the body with the nutrients that it needs in order to function at its optimal level. However, the way you prepare different foods, such as tomatoes and spinach, could affect the nutrients they contain, both in good and bad ways. Raw tomatoes and spinach are incredibly beneficial to your health! Tomatoes, which are actually a fruit and not a vegetable, are packed with lycopene, which is an antioxidant that has been linked to helping reduce the risk of cancer and heart disease. Tomatoes are also a great source of vitamin C, vitamin K, folate and potassium. The flavonoids found in spinach are a type of antioxidant that prevents cholesterol from oxidizing, and that protects the body from free radicals. The folate in spinach is also great for your cardiovascular system, while the abundance amount of magnesium can help lower blood pressure. Spinach is also an excellent source of vitamin B6, phosphorus, fiber, vitamin A, vitamin C, vitamin E, vitamin K, manganese, calcium, protein and iron. When cooking tomatoes and spinach, it’s a win-lose situation regarding nutrients. Some of the more water-soluble nutrients, such as vitamin C and vitamin B, will be expelled from both tomatoes and spinach if they are boiled. If you’re making a soup, these nutrients will remain in the stock. Vitamin levels will, however, be lowered the longer they are exposed to heat. Some nutrient levels may increase when cooking tomatoes and spinach. For example, although the amount of vitamin C in tomatoes decreases as a result of cooking, the levels that antioxidants will be absorbed by the body could increase. Additionally, cooking spinach may decrease the amount of fiber, but it will increase the level of beta-carotene that can be absorbed when it’s cooked rather than eaten raw. For more advice on eating healthy be sure to contact us at The Benefits Store today.